First time to try to build something non-tutorial for me. Ugliness is expected. My basic goal is to create an unoriginal yet functional 2D game foundation in Unity, building the art and coding on my own. (I'll grab open resources for sounds and music.) I'm hoping this will match fairly well with my limited Unity and Aseprite skills, which mainly consist of some simple 2D tutorials and whatnot that I've worked through in the past month or so. The tutorials have been great, but it's a lot of hand-holding. I think my next step is to just make something functional on my own without following along and doing what I'm watching someone else do. I was poking about the podcast titles looking for a theme and saw one called "Living in the Cloud." Boom! Perfect. I'm going with a game called CloudWalker, which will be a 2D Puzzle/Platformer set on clouds. The goal of each level will be to go higher and reach some sort of objective. (If I can weave a story into this somehow it'd be better, but that's a fill in the blank for now.) For a mechanic twist, I want to see if I can play with the idea of what it would be like to have clouds for ground. So maybe standing on a cloud square for x seconds causes the cloud to vanish. Or moving off of a cloud square does the same. And perhaps jumping on a cloud square causes that one to vanish and the two next to it to rise up. I think this will be a good stretch for my very basic Unity/C# skills. I'd like to work in elements to increase the players ability to climb higher (jumping force, the ability to freeze a cloud square to prevent it from vanishing, and perhaps some sort of ladder type tool). I'd also like to work in random elements to remove clouds (lightning, rain, wind). Incorporate 1+ ground shifting mechanics due to weather: wind, rain, and/or lightning. I like this idea a lot. Vertically-dominated platformers are pretty fun, and not very common. Personally, I dislike wind in my platformers, so I vote for the lightning and rain effects instead. (You did want votes, right :P) I might be weird in that anti-wind regard. Thanks for the ideas, Travis! Yes, votes, feedback, anything is welcome. I confess I haven't thought much yet about what wind would do in the game, and what I might be able to even make it do. Maybe shift the clouds relative to the objective, or change the shape of the clouds, or blow objects past the clouds. All of these things might be beyond my skill set at the moment, so it might be something that I don't get around to doing. Again, this is me, but if wind is blowing the character, that is the worst. Blowing objects, not so bad. June 8 -12 are super busy for me with work, so I don't expect to get much done for the first five days. Nevertheless, I spent a bit of time during the day pondering potential story lines for CloudWalker (trying to get home to your home in the sky, famous exiles, etc. ), but haven't really arrived at anything yet. Talking with friends only got me to "Luke" for a character name, but I don't want to go in that direction. 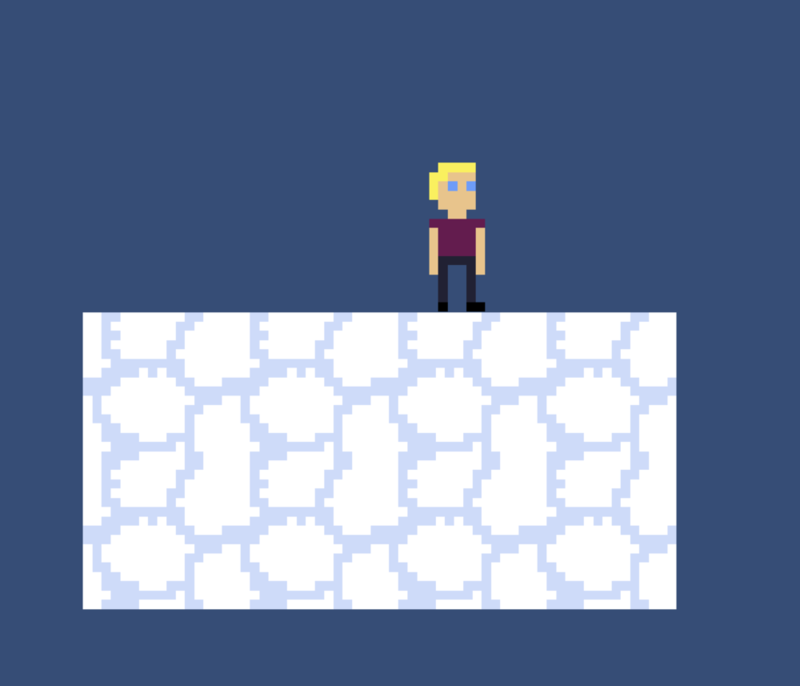 I did have a few minutes to start a new project in Unity and see if I remembered how to create solid ground and get a player character to be standing on the ground. After a few minutes, I realized I was a little foggy on the details, so I gave up. That's the winning attitude. Still in super busy time with work, but I took a bit of time to see if I could get this first objective done. With a bit of revisiting some tutorials, I got things sorted out, and before I knew it, I had a player-like block standing on some cloud-like blocks. I now have a game where a red block sits on some white blocks. Go me! Inspired by my whole standing on clouds achievement, I started working on goal 2, getting some ugly pixel art into the game. After a bit of trial and error with Aseprite, I ended up with some stuff that kind of looks like marshmallows, and a stick-figure type character with arms and legs. Close enough. I had some challenges getting the settings in Unity correct so that the coloring was correct when I imported the art, but a quick YouTube video search cleared up the problem (turn compression to "none"), and I now have a game where a man stands on clouds. Next up is Goal 3: The player can move left and right on the clouds. As anticipated, work was super busy these past two days. No progress made on my wizardjam game. My game is still "man-like thing standing on cloud-like thing". The good news is that I'm past the super busy part of work and can get back to work on this tonight. Next goals are player movement. Game has been upgraded to "man-like thing walking and jumping on cloud-like thing. kind of"
Edit: Okay, I got the sticking to the sides of the clouds thing worked out by adding a material to the cloud, and I got the guy to stop being able to jump again repeatedly while being in the air. Next up tomorrow: Animation for the character: Running, Jumping, and maybe an Idle animation. Fun with Aesprite! Realistic goals, nice updates and excellent progress! Looking forward to seeing how this shapes up. Thanks! I know it's incredibly unoriginal, but I've got to start somewhere. I'd only used two-frame sprite animations that were provided in the Unity tutorials I've done so far, so for this I wanted to see if I could create an 8-frame running animation in Aseprite, then import into Unity and get it to work correctly with player movement. The animations took longer to draw than I thought they would, and I think they could still be a lot better. The back leg in particular looks a bit goofy to me. But I'm happy that it somewhat looks like a person running. Importing them into Unity and getting them to match up correctly with movement went smoothly with the help of some handy dandy tutorials from a Udemy course I have. I only had one hitch, where I accidentally created an extra animation transition that I didn't notice. That caused nothing to work and led to a few minutes of trouble-shooting. I was thinking I'd need to create a separate jumping animation drawing, but one of the running frames seems to work nicely for the jumping too, so I just stuck that in and went with that. With the glitches fixed and the animation in, I think I can call movement done and move on to the next task. Maybe... Player can "win" a level by reaching an exit point. Or... Start working on getting the clouds to disappear with various player actions. I have little clue how to do this yet. Bad news is I got sidetracked by an endless day at real work. It's midnight here and I'm just finishing up. So no progress today. Good news is a four-day super busy trip scheduled for June 21-24 got canceled, so I should have a large chunk of time to work on this the last few days of the jam. Booya. Thanks, phill! I think he'll look less naked on the legs when I add a background, but I'm happy with him. And yeah, I'm liking Aseprite quite a bit. I'm just figuring out many of the features, but it's intuitive and logical. Good to get back to this tonight. I got a bit more done. Pretty easy, but I still needed to refer to a tutorial to get it right. This took me a while to get because I had to figure it out on my own. Super rewarding to get it working! I'm not sure if I'll end up using it in the final game, but I want to playtest the idea anyway. I got stuck in two places. First, I wasn't sure how to structure this in Unity. I ended up putting box collider triggers on the cloud sections, and used OnTriggerExit2D on a script on the cloud sections. I got close quickly, but it took me another 45 minutes to get it working because there are a lot of OnSomethingSomething variations, and apparently the 2D distinction is super important. Who knew. Next up, I think I'm going to try to get the other cloud vanishing mechanics in the game: standing too long on a particular section, and jumping onto a section (jumping will also have a chance to add a section above and to either side of the player). I have ideas now on how I can do these, but it's shaky ground.